I want to share an incredible opportunity for you to use your genetics data from 23andme to create a plan for optimizing your wellness. Learn how at the upcoming Interpreting Your Genetics on-line series from April 1-7, 2019--and it's FREE! No excuses. It's time for a plan! Note: If you haven't done your 23andme genetics test--here's a 10% discount for you! Be sure to order the Health and Ancestry Service for access to health reports, carrier status and your personal genetic data file that you can download into genetic interpretive programs. Want to watch the series now? Register to purchase the Interpreting Your Genetics series for a pre-event price of only $59 for the entire series. Own it to watch at your convenience. Act quickly if you want to purchase--the price goes up April 1st! 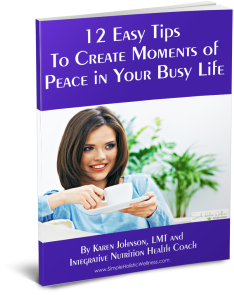 Along with this guide you will receive a free subscription to my motivational newsletter with more tips on managing stress and time, increasing your energy, inspiring wisdom and seasonal recipes. Are you looking for simple solutions to improve your wellness? Do you do so many things for other people that many times your own needs get brushed aside? Or maybe you have a health issue that is weighing you down? Or are you running on the hamster wheel of life figuring you will get to do those things that you really want to do eventually--maybe when you retire? These situations can leave you feeling overwhelmed and drained. You can change all of this starting now and I am going to show you how. Hi, I'm Karen. I created this eGuide to share with you exactly what I do to keep my own stress under control. Let me help you get back to enjoying your life rather than feeling tense as your life seems to race on ahead. ​I notice that I spend less time "dealing" with stress when I take the time to do the things that I really love, along with tending to my own needs. That's when my body lets out a big sign of contentment and I feel truly relaxed and happy. So let me help get you started. Many tips take just a few minutes and can easily be included in your day, leaving you more relaxed and comfortable in your body. are you ready to be empowered over your health and energy -- but have no idea where to start? No one way works for everyone. I will provide you with personal assessments that will help you discover your own bio-individual needs. Given a nourishing diet, and healthy environment and lifestyle, your body knows how to heal itself. Having a greater understanding of your unique needs will allow you to make food and lifestyle choices that are most effective for you. I will help you to make gradual, lifelong changes that enable you to reach your current and future health and lifestyle goals so that you feel more energized, balanced and happy. The approach I use does not dwell on calories, and set amounts of carbs, fats, and proteins. I will guide you on how to incorporate fresh, seasonal foods into your menu to provide you with what your body needs to regain its alignment with what nature has provided. Instead of creating lists of restrictions and rigid dietary rules, I will coach you, step by step, to create a happy, healthy life with delicious foods in a way that is flexible, fun and free of denial and discipline. Are you living your life swimming against the current? Are you ready to start living with the flow? Today could be the beginning of an incredible, life-altering transformation for you. How exciting is that?! I'd be honored to stand beside you to support you in this amazing life process!